A phenomena seen on the clear porcelain glaze surface surrounding in particular the early blue enamels of the Kangxi period. 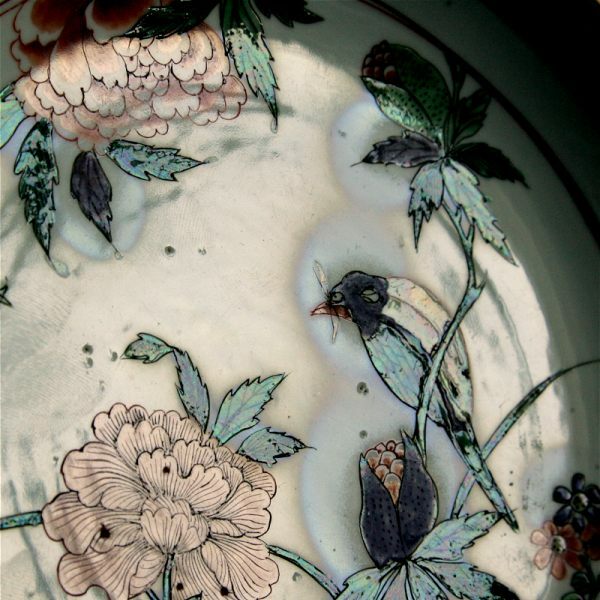 The halo (iridescence) is visible especially when Kangxi porcelain is held at certain angles to the light, and is regarded as a mark of authenticity in wares from the Kangxi period. The halo is likely to have been caused by the use of salpeter as a flux (melting substance) in particularly the blue enamel to lower its melting point and to make it possible to fire the blue together with the other enamels in one firing. The original 'halo around blue enamels is a good sign for a Kangxi date' is still a good one as far as I can see from the majority of export porcelain from the 18th century and later however no expert would look at only one feature for a date - everything should fit. Not even the observation that 'if fired at high enough temperature you get a halo around anything', changes the value of the general observation that actually only relates to famille verte. A lot of the times I think we don't really know why things happens. In the long run a lot of the traditional explanations that have been sent along with the observations, will probably turn out to be wrong, however as theories, they work as a help for us to remember them. The first time I heard about this 'halo rule' it came out of a book about one of the Duveen delers, around the early 19hundreds. I later brought this rule up and got it confirmed in person from some archaeologist I met with in Jingdezhen in the early 1990s, and their explanation was that it came about when the underglaze blue in the wucai decoration was being replaced with a blue enamel and was there to even out the melting temperatures between the enamels. They also mentioned that enamels on the imperial wares was fired several times, in a sequence, from high melting temperature to lower so this technique was not used on Imperial wares. This was easy to see since discarded porcelain had been found with different numbers of enamels added. The archaeologists also said that "eventually a solution was found". From then on I can only guess that if a salt was used, maybe they found a salt that did not created a halo?